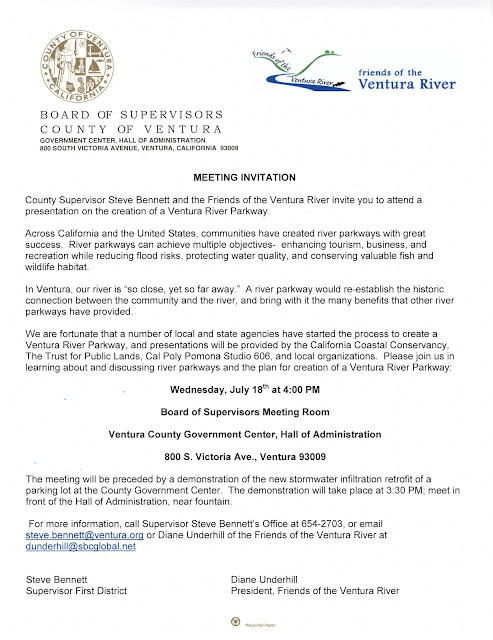 Wednesday July 18 - About 100 people attended an afternoon meeting at the Ventura County Government Center sponsored by Supervisor Steve Bennett and the Friends of the Ventura River. Presentations described the Ventura River parkway vision plan, and the growing movement to rejuvenate the river. Plans For Proposed New Park, Ventura River Parkway, To Be Unveiled Today - a project is underway to try to take some publicly owned land along the river, add to it, and develop recreational facilities like hiking trails to create a Ventura River Parkway. The efforts of a coalition of groups working on the parkway concept will be unveiled this afternoon at a public meeting in Ventura. - KCLU’s Lance Orozco has the story.